One bonus to living in Austin is that there are so many unique opportunities to shop local. One trip to North Loop or down Burnet Road and I know you’ll know what I’m talking about. But, going out on the town means you actually have to leave the house. I’m going to provide you with the opportunity to shop local from the comfort of home- where you can be your makeup free, lounge wear rockin’, top knot-wearing self. And, to top it off, all the shops brought to you in this post are owned, operated, and created by local maker mamas. I LOVE a good opportunity to buy cute stuff, shop small, support moms achieving their dreams, and buy cute stuff. Oh wait, I said that one already… 😉 I’m just going to clear the air and let you know that I will not be receiving any compensation for writing this post from any of the shops below- I just happen to find the products featured completely adorable, and I’m sure you will too. Mount Zi is home of rompers, tanks tops, shorts, and skirts from sizes 0-5t. All items are made from stretchy, soft cotton in modern, fun patterns- perfect for kids to look cute and feel comfy. From now until June 15th take 20% off your order with the coupon code sweetsavejune. Created by Kacie Case of Mama Case Prints and Jessica Wells of Eleventy-Five, their joint venture Fine Little Fits is sure to make you smile with clever sayings and adorable food characters. All tops, leggings, onesies, and shorties are printed on the softest organic cotton. 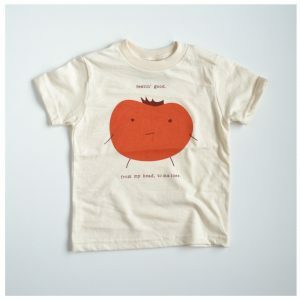 Take, for example, this tomato tee pictured above: feelin’ good. from my head to ma toes. (also available in a onesie or raglan style top). From now until June 15th get 15% off with the coupon code sweetsavejune. The clever and talented duo Shanti and Heather started Party at Your Door to fill all your custom party needs- be it personalized confetti, banners, and cupcake toppers. 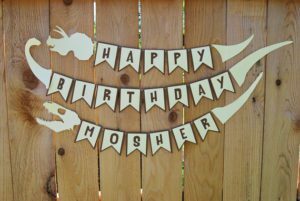 They’re also able to design decor based on your theme; your one stop party shop. (I might have to have an ice cream party JUST so I can order their popsicle banner… eating lots of ice cream at said party would be a bonus.) From now until June 15th get 10% off all items with the code sweetsavejune. I just love these bohemian inspired rompers and high-waisted bloomers from local mama Elizabeth Soto of Two Littles and Lou. As a mom to three girls, I know these pieces could easily become a staple in baby girls summer wardrobe. From now through June 15th take 15% off your order with the coupon code sweetsavejune. I was so excited the first time I came across Zella Woods, a jewelry shop by local artisan Ashley Henderson. Every time I browse her shop, I inadvertently end up adding another item to my growing wishlist. 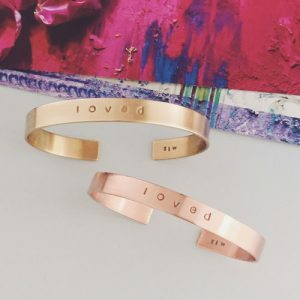 Currently, I am deciding between the “loved” cuff (pictured above), a cuff personalized with my kids names, and/or a baby bracelet. From now until June 15th take 10% off your order with the coupon code sweetsavejune. 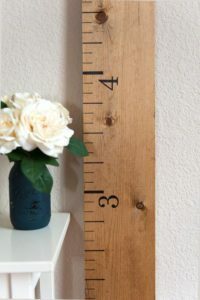 Lauren White of The White Loft creates canvas, burlap, and wooden growth chart rulers. The beautiful design ensures that they are not only a great addition to your decor but will also become a keepsake marking your child’s growth through the years. Look for her specialized “free local pickup” listing and from now until June 15th take 10% off your order with the code sweetsavejune. Ashley Thomas of Nate and Olive Knits makes the cutest bows, headbands, scarves, leg warmers, and beanies in all colors and sizes. 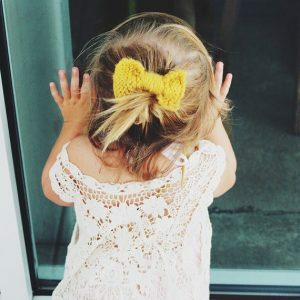 I am loving these hand knitted bows in on headbands and alligator clips! I’ll take one in every color, please and thank you. From now until June 15th take 20% off your order with the code sweetsavejune. 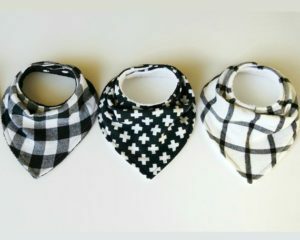 Peggy at Gibberish Threads makes a variety of baby shower gifts- from bibs, teething pads, and burp cloths to nursing cover scarves and gift sets. She also offers an embroidery option if you want to personalized your purchase with baby’s name or initials. From now until June 15th take 15% off your order with coupon code sweetsavejune. 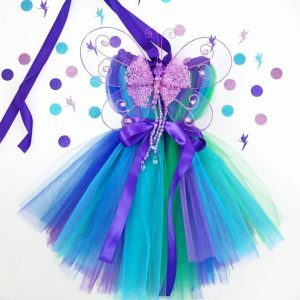 If you visit Kiss Hug Design, you’ll find costumes, accessories, and party decor created by local mama Cindy Williams. That Tinkerbell costume would be so so cute for a Disney trip or Neverland-themed birthday bash! From now until June 15th get 15% off using coupon code sweetsavejune. 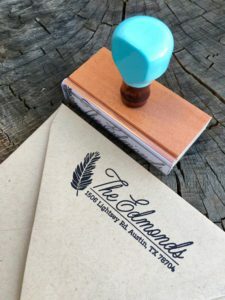 Yellow Bess is quickly becoming a favorite with these personalized return address stamps. You mean I never have to write out my own address again?! Sold! I can definitely use one of these, especially come Christmastime. From now until June 15th take 15% off any purchase using the coupon code sweetsavejune. Do you have a favorite mama maker shop? Spread the word by leaving a link in the comments, I’d love to check it out!